Founded in 1946, Cathay Pacific is the flag carrier of Hong Kong. Over that time, this airline has developed a fine reputation for offering some of the best business class flights in the industry. 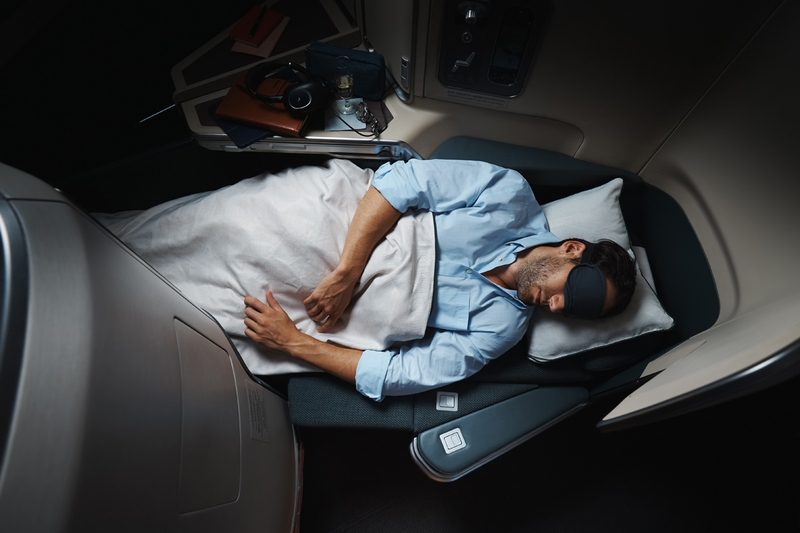 While tight profit margins and greatly increased competition in recent times has called this assertion into question, the product Cathay Pacific offers makes it among your best choices if you are planning a trip to an Asia-Pacific country. Below, we will break down the various aspects of the business class experience on Cathay Pacific. 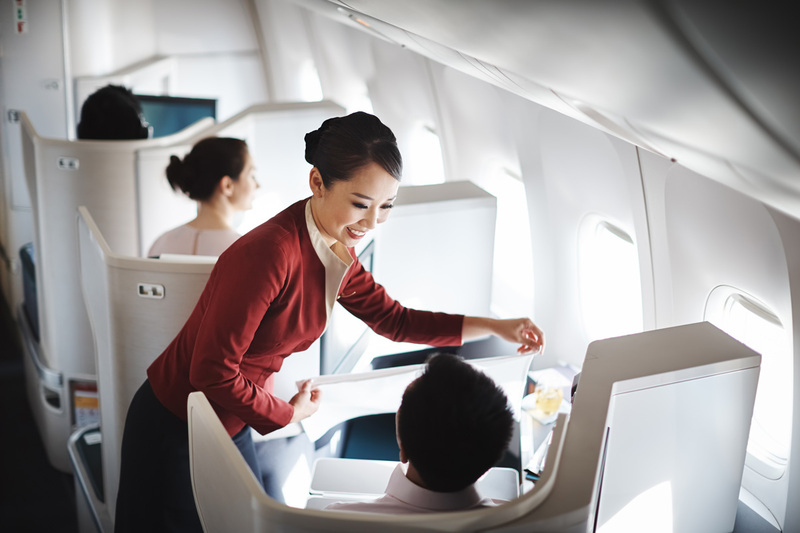 While Cathay Pacific doesn’t offer a chauffeur service for business class passengers, you’ll have access to your own check-in counter, expediting the entire process. 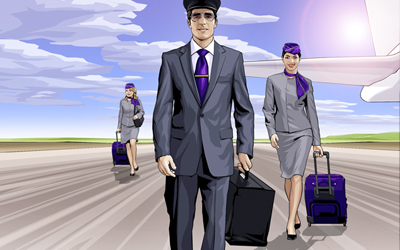 Business class passengers are granted a generous baggage allowance for both carry-on (10 kilograms versus 7 kilograms for economy) and checked bags (40 kilograms versus 30 kilograms for economy). When it comes time to board, you’ll be permitted to take your seat before those in economy. Your lounge experience will vary depending on your point of departure. If you are leaving from Hong Kong International Airport, there are five different lounges to choose from – The Bridge, The Cabin, The Pier, The Wing, and The Arrival. Buffets filled with fresh bread and bistro-style food, a noodle bar (The Pier), coffee and smoothie bars, fast wi-fi, a spacious floor plan, and plenty of seating are just a few of the amenities that you can expect. Elsewhere in the world, you’ll find Cathay business class lounges in places like London Heathrow, Bangkok, and Vancouver, and you’ll have access to the lounges of allied airlines in other destinations around the world. Once aboard, you’ll sit in a seat that is arranged in a reverse herringbone configuration. This will allow you to have direct aisle access, and it will grant you a level of privacy than what is possible in a side-by-side seat configuration. The seat pan is 21 inches (53 centimetres) wide, and it unfolds to a length of 82 inches (208 centimetres) in its lie-flat configuration. The seat also contains AC and USB jacks so you can charge your gadgets, a lamp that will make reading an easy task, and a storage cubby that will allow you easy access to your belongings. Your business class seat comes with a number of amenities to ensure your comfort in-flight. First, you’ll receive a pair of noise-cancelling headphones, which will help maximize your enjoyment of on-board entertainment offerings. You’ll also receive a kit filled with Jurlique skincare products, toiletries to help you freshen up, fresh socks, and a sleep mask. When meal time rolls around, you’ll have access to a selection of dishes that include healthy options, all of which are locally sourced. Multiple courses are served at meals, with starters, cheese plates, and desserts being offered in addition to the main course. Six types of wine are offered for your drinking pleasure, in addition to a selection of other alcoholic and non-alcoholic beverages. Outside of meal service times, a number of snacks are available upon request, including beef burgers, a tea service with scones/sandwiches/tarts, noodle soup, and Häagen-Dazs ice cream. Your seat also comes with a 15 inch (38 centimetre) wide screen, serving as a display for their state-of-the-art StudioCX entertainment system. With a wide selection of current movies, full seasons of popular TV shows, and music tracks from popular artists in a variety of genres that are refreshed on a monthly basis, you’ll find something on your unit that will help you kill time on your long-haul flight. While recent years have seen the emergence of airlines like Emirates and Singapore Airlines, Cathay Pacific has done an admirable job of remaining competitive. Its consistent dedication to quality service, excellent seats, and its wide variety of entertainment options more than make up for meal offerings which have appeared to lag behind competitors in recent times.